340 pages | 156 B/W Illus. 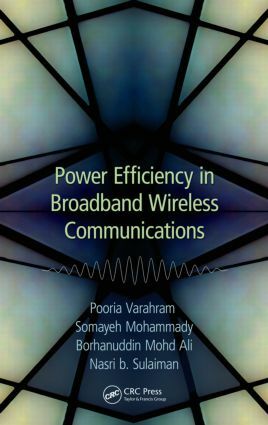 Power Efficiency in Broadband Wireless Communications focuses on the improvement of power efficiency in wireless communication systems, especially of mobile devices. Reviewing cutting-edge techniques for conserving power and boosting power efficiency, the book examines various technologies and their impact on consumer devices. It considers each technology, first by introducing the main physical layer components in recent wireless communication systems along with their shortcomings, and then proposing solutions for overcoming these shortcomings. The book covers orthogonal frequency division multiplexing (OFDM) signal generation and formulation and examines the advantages and disadvantages of OFDM systems compared to alternative multiplexing. It introduces one of the main drawbacks of OFDM systems, peak-to-average power ratio (PAPR), and discusses several PAPR techniques. It also explains how to overcome the main drawbacks of real-world OFDM system applications. Because the most costly device in a communication system that has a direct impact on power efficiency and power consumption is the power amplifier, the book details the behavior and characteristics of different classes of power amplifiers. Describing the evolution of the mobile cellular communication system, it details a cost-effective technique to help you increase power efficiency, reduce system costs, and prolong battery life in next generation mobile devices. Pooria Varahram received his B.Sc. in electrical and electronics engineering from Khajenasir University of Technology in 2002, his M.Sc. in telecommunications engineering from Tarbiat Modares University in 2004, and Ph.D. in wireless communication engineering from the University of Putra Malaysia (UPM) in 2010. He has more than five years of experience in designing and developing a range of electronic and telecommunication-related projects. He has completed his Post PhD in UPM in 2012. He is now senior lecturer in UPM since January 2013. His research interests are PAPR reduction in OFDM systems, linearization of power amplifiers, and microwave power amplifier design.